Verdict: 4.25 / 5The best issue in the series so far, Justice League #5 puts the focus on the detestable Legion of Doom in a great exploration of their villainous plan. Not your typical issue, Justice League #5 is all about the villains this month as Lex’s Legion of Doom takes centre stage in what is sure to be a much-loved addition to the Legion lore. Taking us through a narrative across time, the writers here do a phenomenal job of finally explaining Luthor’s plan, complete with tie-ins to other titles and the No Justice arc. 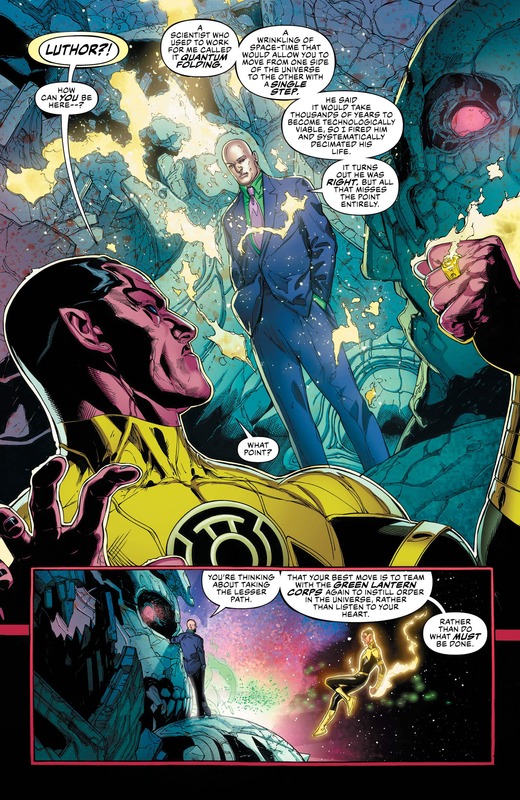 Luthor, a flawed genius, first confronts Sinestro at the source wall, with a proposition for him to join the Legion and lead the Ultraviolet Lantern Corps. It is here we understand how Luthor gained access to all these secrets of the DC universe. Using his intelligence to build a time machine, Lex travelled to the future, where it is revealed that it is his work that moves humanity forward into some very different. As the end of the universe crumbles, it is Luthor who is standing tall, with many having looked at him as some kind of god. It seems Lex had always had the right philosophy but never the tools to fulfil it. He just needed to get to his discoveries much sooner than history had proclaimed. It is here we understand how Luthor gained access to all these secrets of the DC universe. It is in his father’s secret room, which was previously seen in this series, that he finds the symbol of Doom and the wonders it would unlock. Using this, he could gain access to many of the forces of the multiverse, such as the Ultraviolet powers. In having these abilities, he is able to gift each member of the Legion a different power that they alone are tailored to control. Gorilla Grodd, for instance, is given the powers of the Turtle through his physic abilities, in order to combat his long-term rival, the Flash. This allows each member of the Legion of Doom to play a role in this grand scheme, giving them something useful to do, whilst playing off of their abilities and rivals. With each member representing a corner of the universe, this team is incredibly well crafted for the story. 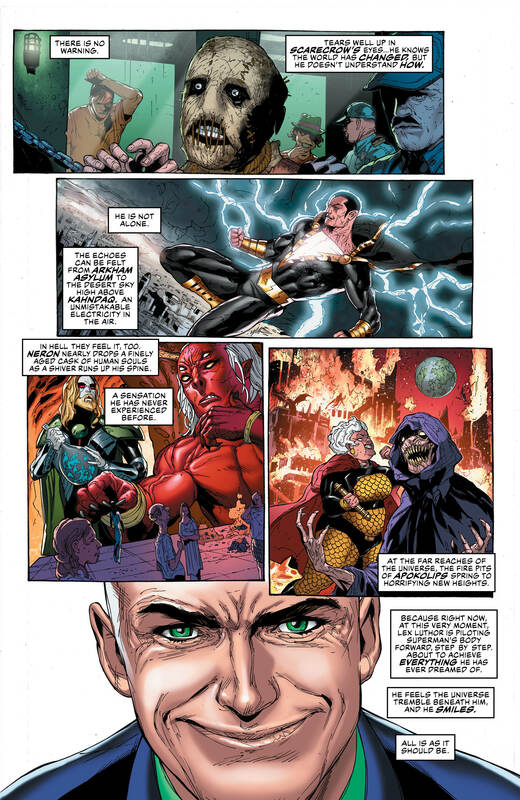 The other members are less featured in Justice League #5, however, with Luthor being the standout, although moments are given to Sinestro, Grodd and ever the scene-stealing Joker. It seems the Clown Prince Of Crime is testing the brand new torture equipment on himself, becoming hysteric at the pain of it. The story ends how we ended the last issue; with Luthor inside Superman ready to enact his plan. With the next issue titled Luthor’s Big Move, it is clear that it is all about to get started. Lex has been used to perfection here, showcasing the intelligence and ego of the character. It is great for the villains to have some showcase here and will benefit the title moving forward. The art also perfectly captures the madness amongst the group, with a constant gleam of mischief in Lex’s eyes. Justice League #5 is brilliant work from this creative team and by far the most successful issue in the series so far.